Valve has revealed very few upsets in the winning lineup of 2018’s Steam Awards. Voting for The Steam Awards was opened on December 20th, coinciding with the annual winter sale rush. Any non-limited Steam account - users that have spent at least $5 - were eligible for voting, with the usual lineup of badges and trading cards up for grabs for participating. If you’re a regular reader of our weekly Steam Top Ten, this lineup won’t be a surprise. Curiously for a 2018 awards list, not a single game among the award-winners was released in the last twelve months. 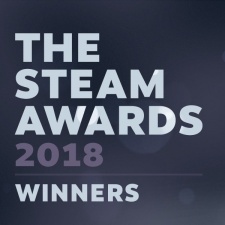 As a community-voted award, The Steam Awards wears its heart as a popularity contest on its sleeve. But even then, some of the category choices are strange. Is the Labor of Love category - for titles that have been out a while and are still being supported by their developers - a plucky newcomer like Stardew Valley, or a game like No Man’s Sky that overcame a rough early launch to win the support of its fans? Or is it, as the eventual winner would suggest, a game that kicked off life as one of the biggest entertainment products of all time? The Steam Awards should likely be treated as an insight into what the platform's most active users are into as opposed to a sign of prestige.